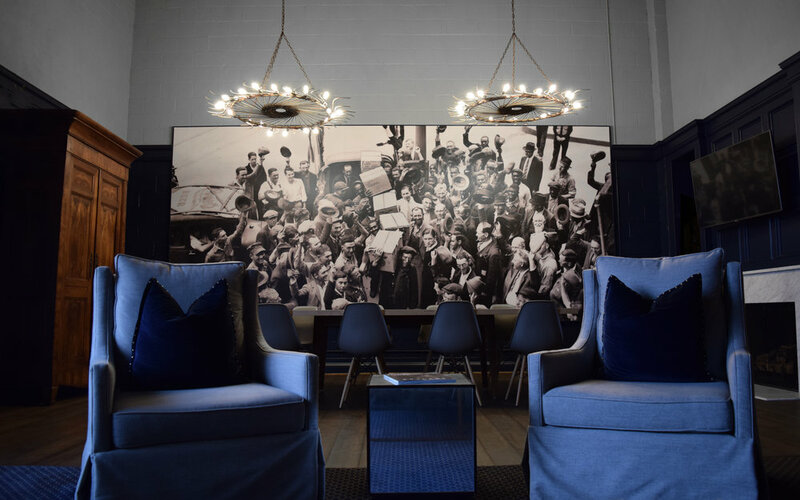 Our tasting room is beautifully designed and decorated by renowned Atlanta architect Oliver Carter and our own Head of Private Events, Kelly Chasteen. 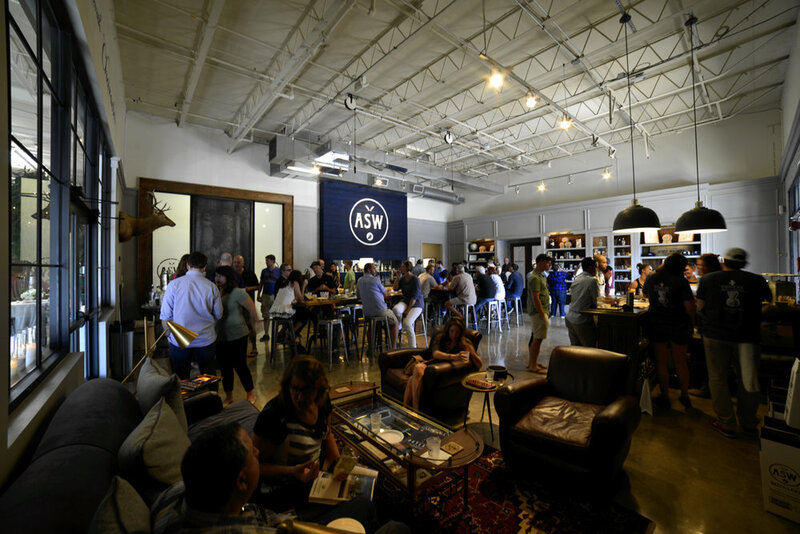 From the brushed walnut bar and the brass footrests, to the lounge area and the gorgeous accent lighting, to the 15' weathered metal estate door and hand-painted mural, Kelly put the tasting room together with upscale private events in mind. We spent weeks searching for the perfect mural depicting the end of Prohibition. Nearly every photo we found was from New York, Boston, or Chicago. Finally, we found one in the old AJC archives showing the day that Prohibition ended in Marietta Square. It now adorns the wall of our whiskey lounge, along with custom lights, a burled walnut French armoire, built-in-cabinets, a fireplace, and comfortable swivel chairs. It's almost like a page in a magazine, right? The whiskey lounge is an optional feature. For larger private events, groups have enjoyed use of the breezeway beside our tasting room in addition to the tasting room itself. We open the doors between the two for a seamless experience. Contact us to inquire whether the breezeway is available for your requested date. 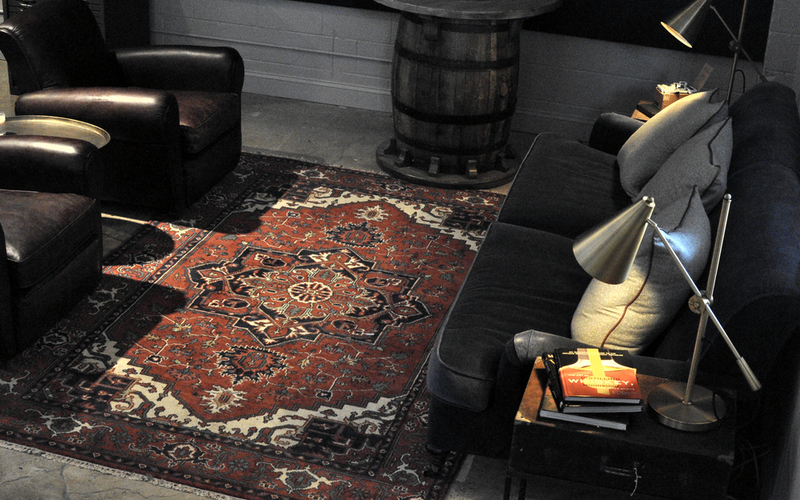 Our whiskey lounge includes comfortable armchairs and a gas fireplace. The whiskey lounge is an optional feature. We have custom, hand-painted murals by Adam McNeil Signs throughout the distillery and greenspace. Photo credit: Chad Boone. Our refurbished Airstream Bar includes chalkboard sign, marble top, a sink, sound system, and a refrigerator. Perfect for ordering a drink in comfort. We offer complimentary tours during private events if you so elect. Our whiskey barrels are just one of many sights on the tour. Our tasting room's lounge area features leather chairs, a comfortable couch, and - not pictured here - a schematic of our production process. One of the many reasons guests have enjoyed private events here. For mild spring and fall days, our outdoor seating can accommodate up to 15 people (not including the dog house). Kelly spared no expense in furnishing our whiskey lounge with comfortable seating, beautiful lighting, and custom woodwork for your private events. The whiskey lounge is an optional feature. Above the bar sits a custom, hand-painted mural by local muralist Adam McNeil. It's a unique touch to our tasting room and makes a great backdrop in photos. 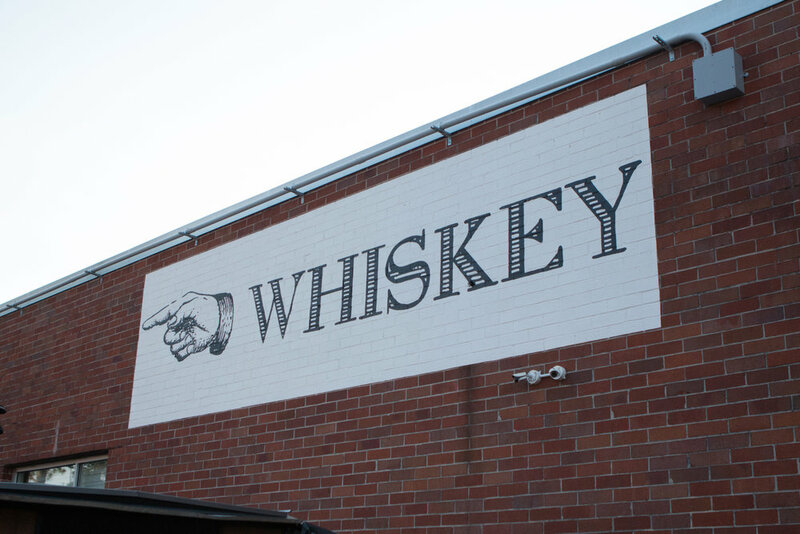 In addition to our custom bar and hand-painted mural, the distillery features a beautiful, 15' weathered metal estate door that guests enter for the distillery tours we offer as a complimentary option for your events if you so elect. 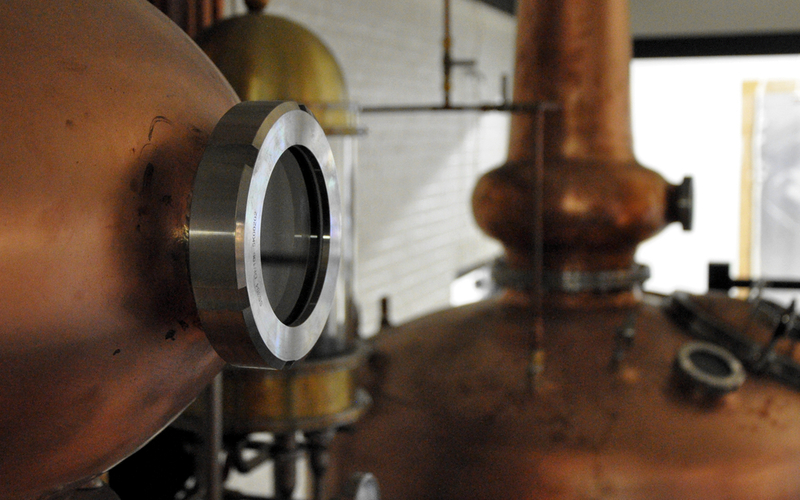 Guests can see the double copper pot stills that we craft our whiskey on during optional tours. Our tables were custom-made in Atlanta out of old bowling alley lanes, and are accompanied by French-style metal stools. The tables can be raised or lowered to your specifications. Our space can also accommodate additional tables for more seating options. The green space features an Airstream bar, lawn games & string lighting, among other amenities. This view is looking out from the Airstream bar. (1) mashing - heating the grains to activate enzymes that break down the starches in the grains to simple sugars. (2) fermenting - pitching yeast into our fermenters to convert the simple sugars from the mashing process into ethyl alcohol. During this stage, acids, aldehydes, and other molecules that give whiskey its final flavor develop as a byproduct of the yeast's activity. 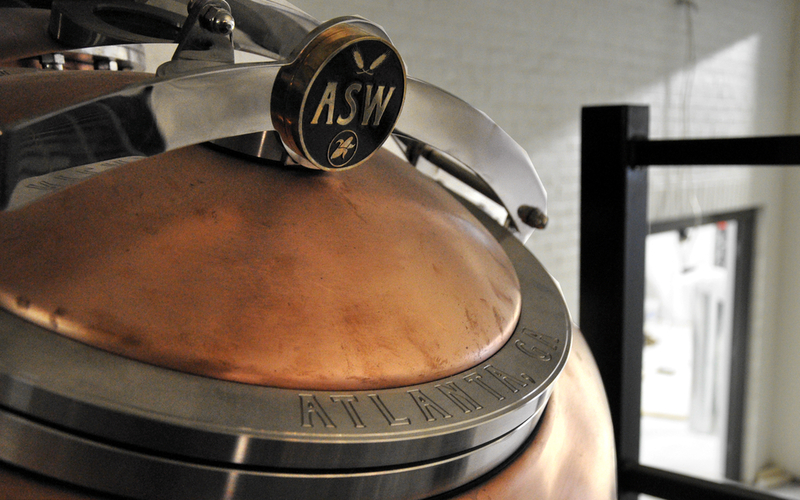 Unlike most distilleries that use pot stills, we leave the grain solids in during fermentation ("on the grain fermentation") as adherents of the Southern innovation of grain-in distillation. (3) distilling - transferring to our wash still the fermented "distiller's beer" (as the 5-10% alcohol content liquid is called when it is done fermenting), heating the distiller's beer until the ethyl alcohol boils off, and transferring the boiled-off ethyl alcohol (around 25% alcohol by volume) into our spirit still for a second, refining distillation. 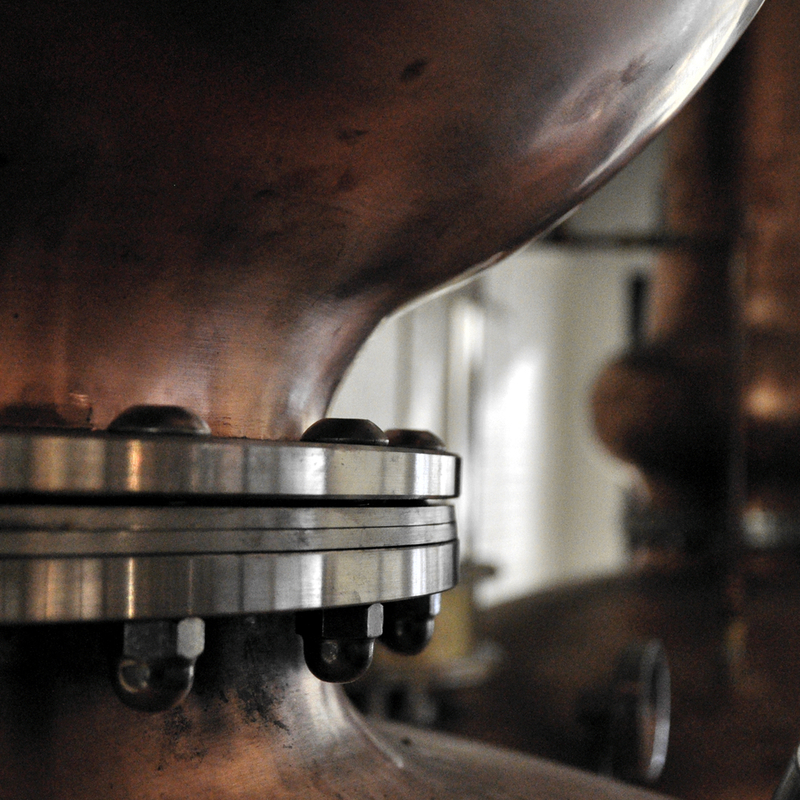 (4) maturation - transferring the whiskey fresh off the spirit still into oak barrels for aging to perfection.